Take your homemade pasta to a whole new level with this specialty class. Create handmade pasta with a variety of colours, flavours & shapes. You will make a pasta dough, and then experiment with adding colour and flavour with prepped ingredients like beet puree and cooked squash. Then learn to make different shapes with the pasta roller and Chef Chris’s tips & tricks. 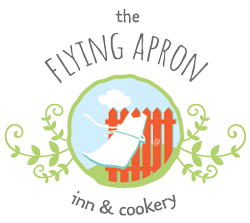 • You will take home the pasta you make and a jar of Flying Apron Tomato Basil Sauce.